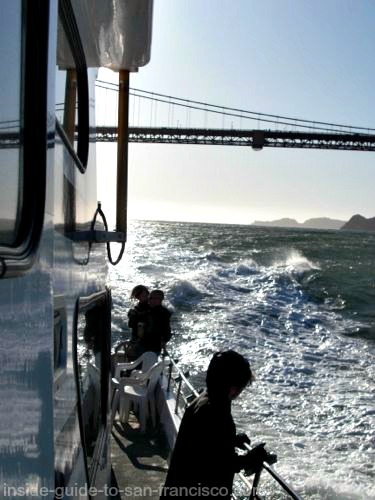 Going out on the water with one of the San Francisco Bay cruises is one of the best SF experiences, in my opinion. 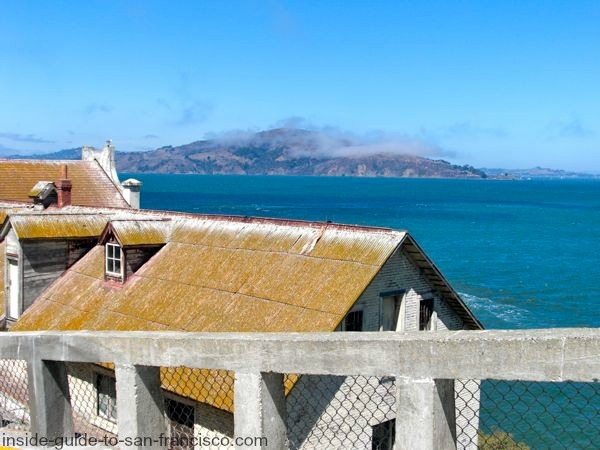 You'll see incredible views of the city, the bridge and Alcatraz that you can't get on land. Destination Cruises - going from San Francisco to another location. 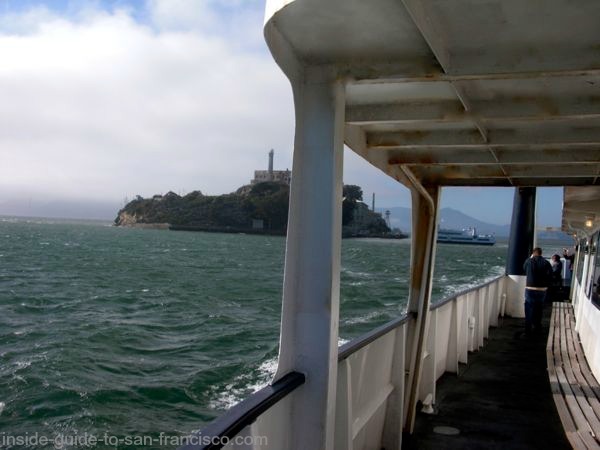 Alcatraz Cruises - to the island. 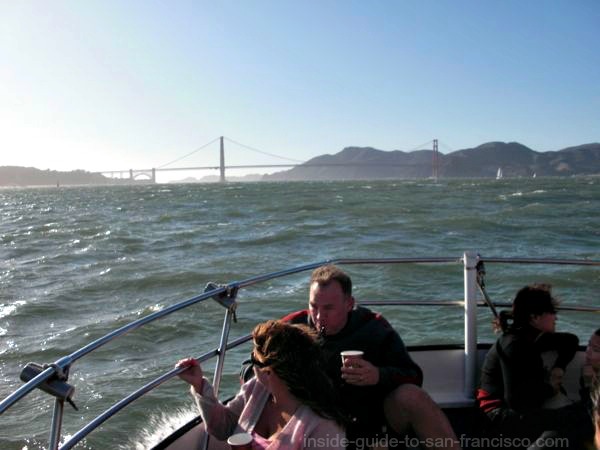 There are so many San Francisco Bay cruises, but which one to choose? The local ferry system is a great way to get somewhere and see the sights at the same time. The Blue and Gold Ferry company runs part of the ferry system for San Francisco Bay, and the ferries depart from the Ferry Building and Pier 41. The Blue and Gold Fleet also does bay tours, but more on that later. The Golden Gate Ferry company runs ferries across the bay as well, departing from the Ferry Building. Here are the Blue and Gold ferries that have scenic routes and take you to pretty locations. Kids (5-11) and seniors (65+) are $7.50 one way (Angel Island $5.50 one way). The Golden Gate Ferry also runs boats to Sausalito and Tiburon; their ferries leave from the Ferry Building. See the current schedules: Sausalito & Tiburon.. Seniors 65+ and youth (5-18) pay $6.00 one way. Do you need to book ahead? No, there's plenty of room on the ferries. The tickets are not for a specific time or date; they just need to be used within 90 days. Why do the times vary? The ferries have a variety of routes, so it may be longer when they make additional stops. Both the Blue and Gold and the Golden Gate ferries go out to Angel Island. For info on Angel Island, and how to get there, see my page on Angel Island. 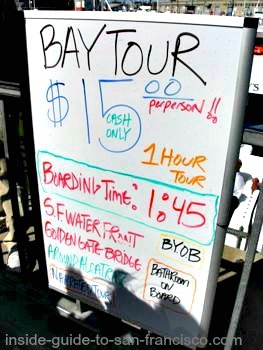 Tip: for the cheapest boat ride in San Francisco, you can take the "short hop" (about 10 minutes) on the Blue and Gold Ferry between Pier 41 (on Fisherman's Wharf) and the Ferry Building: $1.60 for adults and youths, $0.80 for seniors. Sail all along the Embarcadero waterfront for basically nothing! You have to look at the hourly schedules for SF-Vallejo, SF-Alameda, SF-Oakland ferries to find the runs that stop at both places. See ferry schedules. 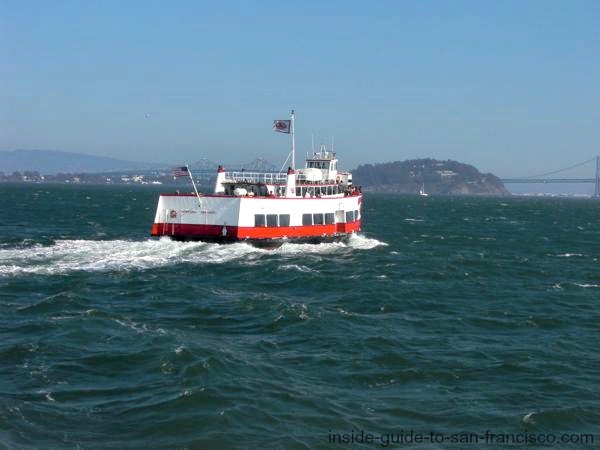 The ride across SF Bay on the Sausalito Ferry was named as the second best ferry ride in the world by the Society of American Travel Writers in 2009 (second only to the Starr Ferry ride in Hong Kong). It's a gorgeous ride, with great views of the city skyline, Alcatraz, Angel Island and the Golden Gate Bridge. Highly recommended, and a bargain to boot! Plus Sausalito is fun to explore. 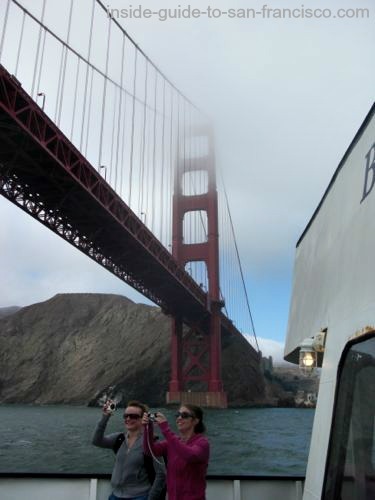 Want to bike across the Golden Gate Bridge to Sausalito, and take the ferry back? 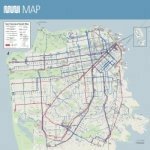 See my guide to biking the bridge: how to rent the bikes, what the ride is like, tips for taking the ferry, plus maps of the route and photos of the trip, at biking the bridge. If you are biking to Sausalito from SF and want to return on either ferry (Blue and Gold or Golden Gate) with your bike, lots of people are going to be trying to board with bicycles in Sausalito, especially in summer and in late afternoon. It's a lot easier to travel back to the city without the bike, and now there's a company that will return your bike for you at $12 per bike (doesn't operate in winter). See bike return service for more details. Alcatraz cruises are in class by themselves. Only one company, Alcatraz Cruises, at alcatrazcruises.com, runs ferries out to Alcatraz where visitors can get off the boat and explore the island. All the other Alcatraz cruise companies just sail around the island, which is fun, too, but just be clear on which one you are doing. The Alcatraz Cruises' ferries leave from Pier 33. 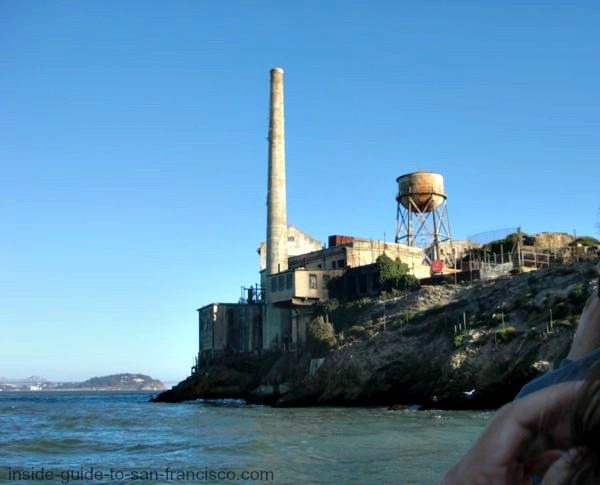 To learn more about the Alcatraz Island tours available and the best ways of getting tickets for Alcatraz, plus what to expect out on the Rock, see Alcatraz tours. Alcatraz sold out? Tickets for the Alcatraz ferry sell out weeks, and sometimes months, in advance during the summer and holiday periods. But never fear, there are ways of getting Alcatraz tickets, even for sold-out days. 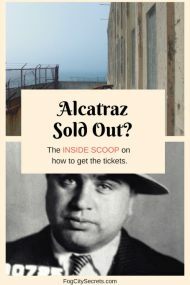 See my tips on the four ways to get those elusive tickets, at last-minute Alcatraz tickets. Before you book a bay cruise, check to see if there are discounted tickets at Goldstar.com. Often the one-hour bay cruises and the Rocket Boat are available for half-price, and sometimes the other cruises, too. Goldstar also has lots of half-priced tickets for other SF attractions and events. I always check with them first before I get tickets for activities in San Francisco and the surrounding areas. It's free to join, then you can see what they've got. See Goldstar.com. 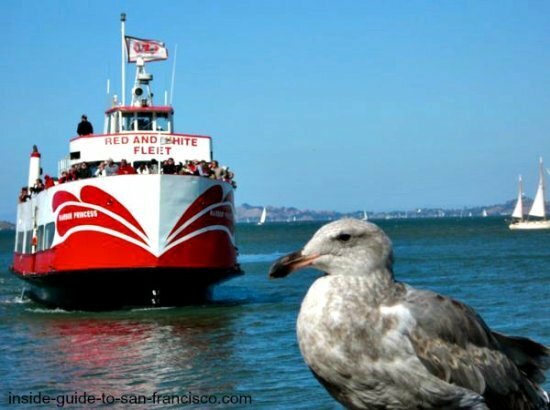 If you only have a short time in San Francisco, or can only do one thing at the Wharf, this is the San Francisco Bay cruise to do! Three different companies have boats that do the one hour cruise that starts at Fisherman's Wharf, sails out and under the Golden Gate Bridge, then circles Alcatraz and returns to the dock. The views of the city and bay are spectacular, and sailing under the Golden Gate Bridge is one of those OMG experiences. Prices are reasonable, too, especially with the smaller fishing boats, and the discounts available on the other cruises. The Red and White Fleet. Very similar to the Blue and Gold. This is the original bay cruise in San Francisco; a family-owned business, they've been offering this cruise since 1939. Drinks and snacks available, full bar. Recorded narration. Audio on headphones in 16 languages. Operating daily, frequent departures, starting at 10 a.m. Adults $32. From Pier 43 ½. For more info and booking, see Red and White Cruise. The tickets are open tickets for any day within a year of the booking date. The small fishing boats docked at the marina on the main street of Fisherman's Wharf (Jefferson Street at Jones). Fewer people, lively wave action, salt spray if you sit in the front. Live narration (though hard to hear in the front). No snacks supplied, but you can bring your own refreshments, including alcohol. Bathroom on board. $15, cash only. No advance reservations, just sign up at the dock on Jefferson Street for the next trip. They leave about every hour. One of the prettiest things to see in San Francisco are the white sailboats on the blue waters of the bay. Going out on one of them is even better! 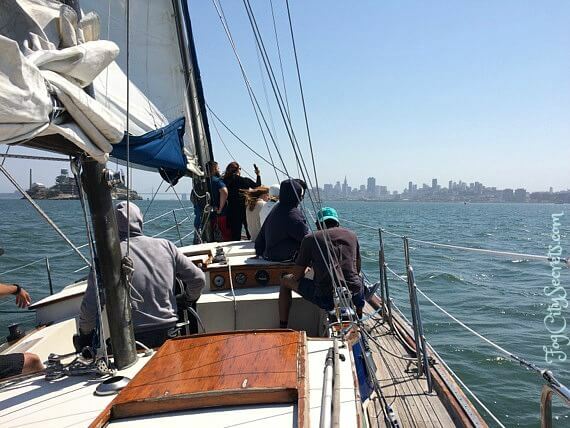 The San Francisco Sailing Company runs several bay tours on their sailboats that I highly recommend. I went out on their 90-minute sailing tour...what a treat! It's like being on a private yacht, fun and relaxing, with a mellow crew and free wine and beer. Leaves from Pier 39. It's not even expensive: only $49 (and I got my tickets for $27 through Goldstar, now $30; check Goldstar to see if it's available). 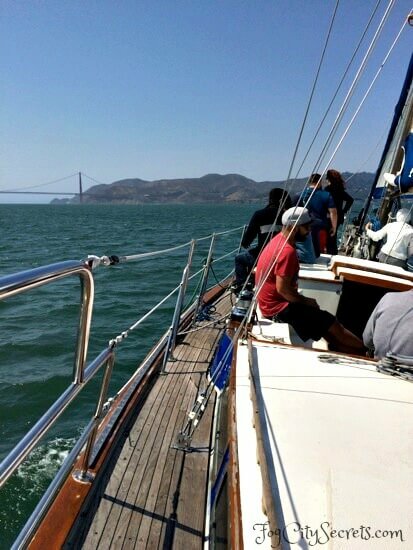 If Goldstar doesn't have tickets, you can book the sailing cruise at SF Sailing Tour. See photos of the cruise, and details about the trip, at sailboat cruise. 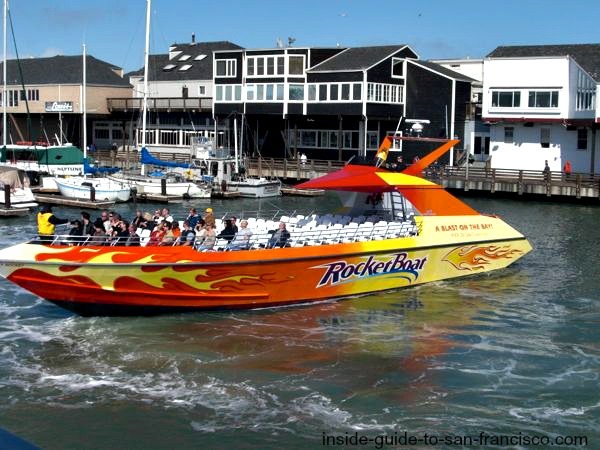 If you're up for a wild ride, try the Rocket Boat, run by the Blue and Gold Fleet from Pier 39. High speed, sea spray and rock and roll. A 30 minute ride, $30 for adults, kids less. I had a great time on this one! The Rocket Boat operates May through October. Goldstar often has half-price tickets for this one; you can check for them at Rocket Boat tours. Otherwise, you can book at Rocket Boat (when available). For more details on what the trip is like, see my page on the Rocket Boat ride. This is a newer addition to the boat rides in SF Bay. The RIB is the more extreme version of the Rocket Boat: 90 minutes zooming around SF Bay on an inflatable boat, and a lot wetter (they provide you with rain gear!). 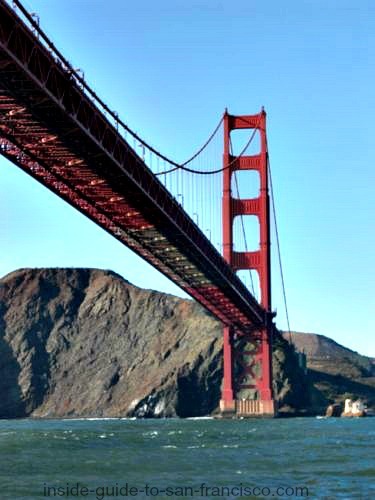 This cruise also includes a guided tour of the bay, narrated by the captain (the Ferry Building, Fort Point, the sea lions, the Presidio, goes under both the Golden Gate Bridge and the Bay Bridge, around Alcatraz, etc...and sometimes the whales are out there). Limited to 12 people. I haven't tried this one yet, but it looks pretty wild and fun! For more on this ride, and booking, see RIB boat tour. Several companies have dinner and evening cruises on the bay; a very pretty time of day to see the lights of San Francisco and the sun setting behind the Golden Gate. The Red and White Ferry Sunset Cruise. 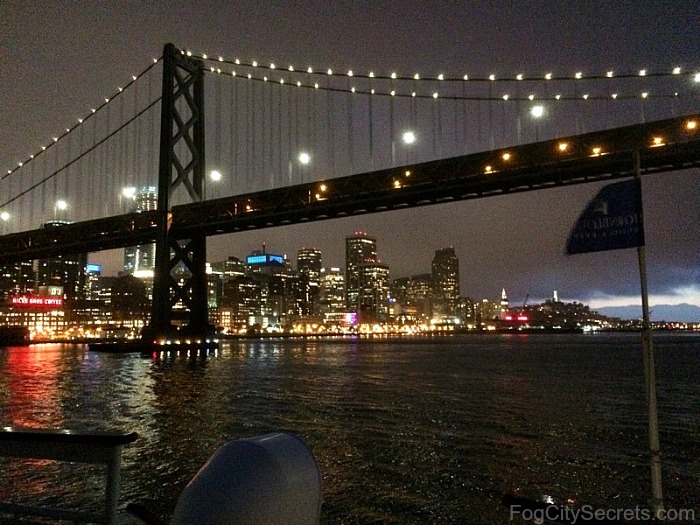 This is a fun way to get out on the bay and see the city as the sun goes down, with all the lights coming on. 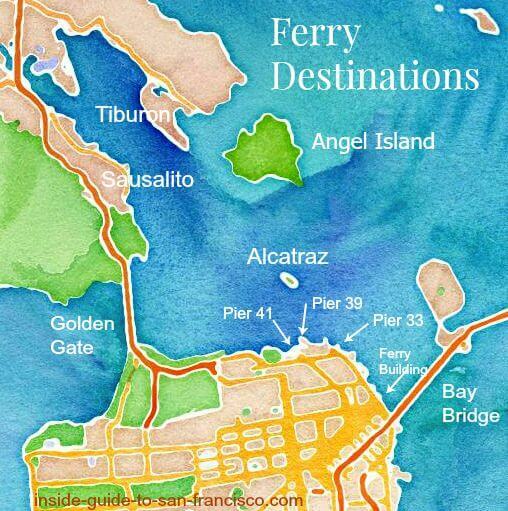 They sail past Alcatraz, Angel Island, the SF waterfront, Sausalito and under the Golden Gate Bridge (very cool). Meanwhile, they put on a generous buffet spread, so no one goes hungry. This is a popular cruise. It's two hours of sailing and $68. 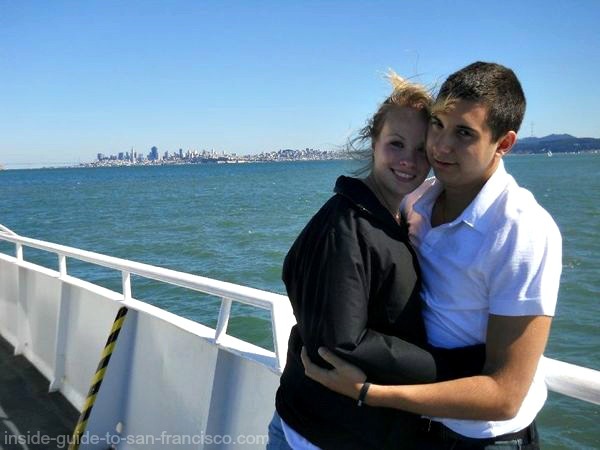 To check out the Sunset Cruise and booking info, see SF Bay Sunset Cruise. The Catamaran Sunset Cruise. You also have the option of sailing out at sunset on a catamaran. This cruise is 90 minutes and $60, and includes hors d'oeuvres and two free drinks. Great views of the city and the Golden Gate Bridge. Also very popular. For more info and booking, see catamaran cruise. Hornblower Dinner/Dance Cruise. Hornblower, a classy company that provides sailing trips on their yachts, has a San Francisco Bay dinner/dance cruise that is a lot of fun. Sailing around the bay on a yacht, dancing to a live band or DJ, and savoring a four-course meal...like watermelon and feta salad, crab gazpacho soup, chicken cordon-bleu, or maybe glazed salmon, with key lime pot de creme and macaroons, or perhaps berry parfait with Gran Marnier. Delightful! I've been on several Hornblower evening cruises - a very professional outfit. It's magical to be out on the water at night with the city lights sparkling in the distance. The views of the city and the bridges at night were incredible, and the food was great! A fun San Francisco experience. 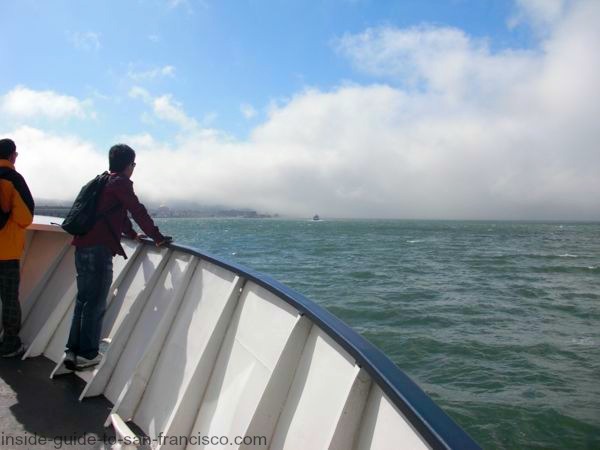 For all the details on our dinner cruise experience, plus photos and maps, see my page on the SF dinner cruise. The Hornblower dinner/dance cruises are 2.5 hours (3 hours on Friday and Saturday), for $141.36 per person. For more info on cruise and booking, see Hornblower dinner cruise. Goldstar.com often has discounted tickets for this cruise; check for them at Goldstar tickets. We got our tickets through Goldstar for $96.50 each. Sad to say, but Ride the Ducks closed their San Francisco operation on September 7, 2015, citing a difficult business environment, possibly related to a new requirement that tour guides can't also be the bus drivers. 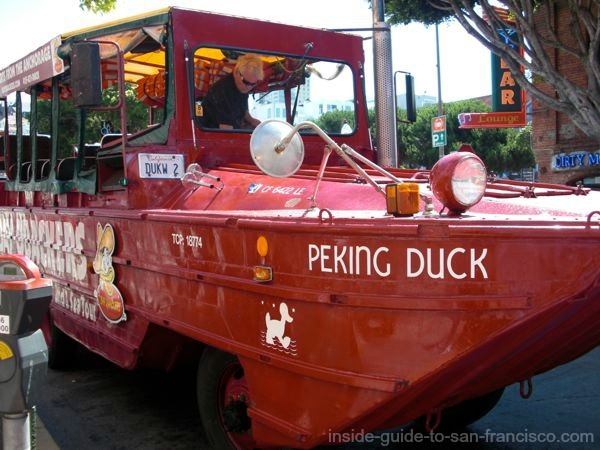 They still run their boats in other cities, but no more quacking in SF, sniff. 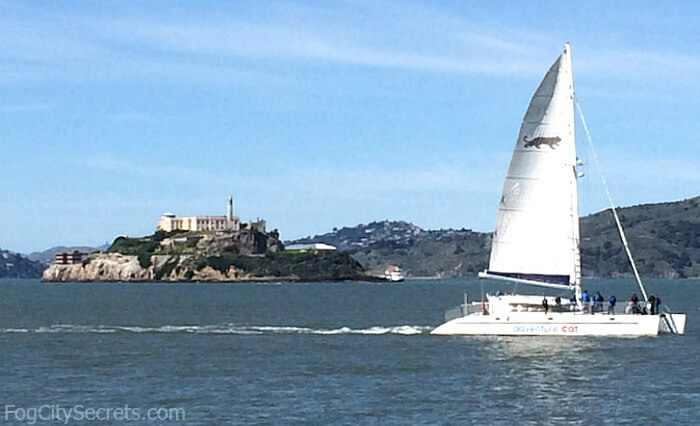 There are a lot of fun cruises on San Francisco Bay, but if I had to pick some favorites, they would be the Alcatraz cruise and tour, the fishing boat cruise, the sailboat cruise, and Hornblower's dinner cruise. If you have several hours and have any interest in the history of the island prison, take one of the Alcatraz Cruises tours to Alcatraz (ferry and prison tours included). Not only is the building fascinating to explore, the views of the city and bay are wonderful. (See Alcatraz tours for details). You don't sail out to the Golden Gate, though. For that you have to take one of the other cruises. I think it's more exciting to sail out under the Golden Gate in a smaller boat than in one of the much larger ferries. You really feel the waves and the ocean seems mightier, especially just outside the protection of the gate. The boat goes all the way around Alcatraz, so you see the other side that's not visible on the actual Alcatraz ferry ride. Also, it's a real bargain - still only $15. 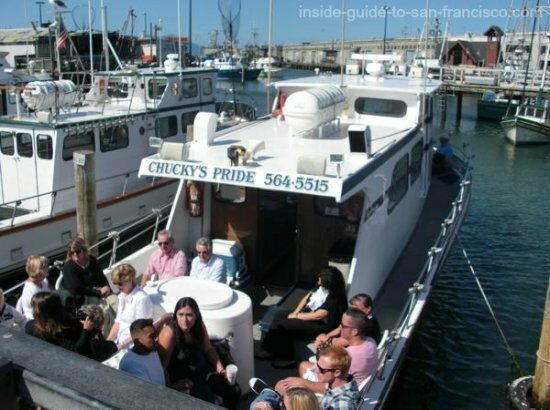 We went out on Chucky's Pride, one of several fishing boats available for the cruises. On the Fishing Boat Cruise. Gliding over the water with just the sound of the wind and the gulls, the spectacular views, with only a few other people, is the ultimate SF Zen experience! See sailing on the bay for my experience on the sailboat cruise. A nighttime extravaganza: a delicious four-course meal, and stunning views of the city and the bridges all lit up. Amazing! See dinner cruise for more details about the cruise. 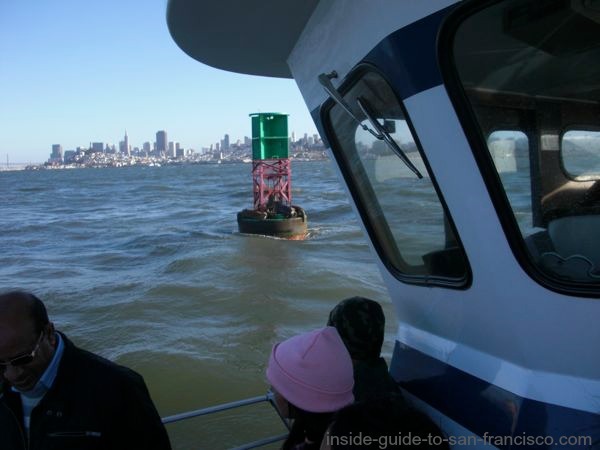 If you have problems with seasickness, it might encourage you to know that I've never felt sick on one of these San Francisco Bay tours. And that is coming from someone who can't even watch the Teacups at Disneyland. The Bay City Guide. This free guide is available from the magazine stands all over the Fisherman's Wharf area. They have lots of discounts for activities in the wharf area, including a few dollars off of the bay cruises (though not the fishing boats). You can also get their coupons online at www.baycityguide.com. Discount cards like Go San Francisco, SF CityPass, and San Francisco iVenture Card include bay cruises, along with other attractions. If you plan to do one of the Hop On, Hop Off, City Bus Tours, there are some good packages that combine the bus tour with choices from a long list of attractions, including several fun bay cruises. And if you want to skip the bus tour, you can pick any 3, 4, or 5 attractions on the list. You can save $2 by booking these online. Check out the Value Passes at City Mega Pass. If Goldstar doesn't have discounted tickets for the cruise you want, it's very convenient to book them through the Viator tour company. There are lots to choose from. To see the list of bay cruises available for booking through Viator, bay cruises. The Golden Gate Bridge hidden in a fog bank - not unusual. The Alcatraz Ferry (alcatrazcruises.com) doesn't go around the island, except on their night tours. This is the view from the other side, which you see on SF Bay tours with the Blue and Gold Ferry, the Red and White Ferry, and the fishing boats. Like the dark side of the moon? Under the Golden Gate on a sunny afternoon. The Red and White Ferry headed home.